After reading thru these nature quotes, you should feel just a little bit happier — and maybe like going on a walk. Man has always turned to nature for inspiration. Whether it’s for beauty, peace, success, or anything else, nature has always provided answers to our questions. We are not born into nature, we are born out of it. Nature has everything we need to live, get inspired from, learn from, grow from, and succeed. There is nothing like it. Everything comes from it and everything goes into it. That’s part of what makes these nature quotes so interesting. Nature has always been cherished for its boundless and unrivaled beauty. Again, it is has been the source of inspiration of the poets and authors. It has also inspired the men and women of science, designers and philosophers. Whether you are looking for inspiration from nature or looking for beautiful words about nature, here is a collection notable words on nature. In the woods, we return to reason and faith. There I feel that nothing can befall me in life, – no disgrace, no calamity (leaving me my eyes), which nature cannot repair. Be patient with yourself – nothing in nature blooms all year. Your deepest roots are in nature. No matter who you are, where you live, or what kind of life you lead, you remain irrevocably linked with the rest of creation. We don’t inherit the earth from our ancestors, we borrow it from our children. I have never before, in my long and eclectic career, been gifted with such an abundance of natural beauty as I experienced filming ‘War Horse’ on Dartmoor. To sit in the shade on a fine day, and look upon verdure, is the most perfect refreshment. One of the things that people don’t realize is that that natural beauty, those recreational forests, they have an economic development impact for the state as well. Each moment of the year has its own beauty. The destruction of the natural beauty, the ecosystems, and the majesty of mountains affect us in ways we’re not even aware of. Every time a mountain is beheaded, we chop off a little part of our souls. I am in love with this world . . . I have climbed its mountains, roamed its forests, sailed its waters, crossed its deserts, felt the sting of its frosts, the oppression of its heats, the drench of its rains, the fury of its winds, and always have beauty and joy waited upon my goings and comings. And earth and air, and rain. Keep your love for Nature, for that is the true way to understand art more and more. I will be the gladdest thing under the sun. I will touch a hundred flowers and not pick one. The sun, with all those plants revolving around it and dependent upon it, can still ripen a bunch of grapes as if it had nothing else in the universe to do. Nature, like a loving mother, is ever trying to keep land and sea, mountain and valley, each in its place, to hush and angry winds and waves, balance the extremes of heat and cold, of rain and drought, that peace, harmony, and beauty may reign supreme. The Natural Law is the final and absolute authority governing E Te No Ha, the earth we call our Mother. The creation of a thousands forests is in one acorn. There is no power greater than the Natural Laws. These powers were set up by the Great Spirit in such a way that the human being has no access to it, except by obeying. If we choose not to follow the Natural Laws, our lives will be filled with confusion, tension, anxiety and stress. If we poison the Earth, we poison ourselves – If we poison the Water of the Earth, we poison ourselves. As we do to the Earth, we do to ourselves and our children, even the children unborn. May we think about this today and ask ourselves, Are we holding and acting toward the Mother Earth in a good way? All those who love Nature she loves in return, and will richly reward, not perhaps with the good things, as they are commonly called, but with the best things of this world-not with money and titles, horses and carriages, but with bright and happy thoughts, contentment and peace of mind. I want to be care-free; I want to be still! I want to be one with the blossoms and birds. I believe the world is incomprehensibly beautiful — an endless prospect of magic and wonder. tumble and roll and climb in riotous gladness! In those vernal seasons of the year, when the air is calm and pleasant, it were an injury and sullenness against Nature not to go out and see her riches, and partake in her rejoicing with heaven and earth. What I know of the divine sciences and Holy Scriptures, I learned in woods and fields. I have no other masters than the beeches and the oaks. Time destroys the speculation of men, but it confirms the judgment of nature. God is the friend of silence. Trees, flowers, grass grow in silence. See the stars, moon, and sun, how they move in silence. Climb the mountains and get their good tidings. Nature’s peace will flow into you as sunshine flows into trees. The winds will blow their own freshness into you and the storms their energy, while cares will drop off like autumn leaves. 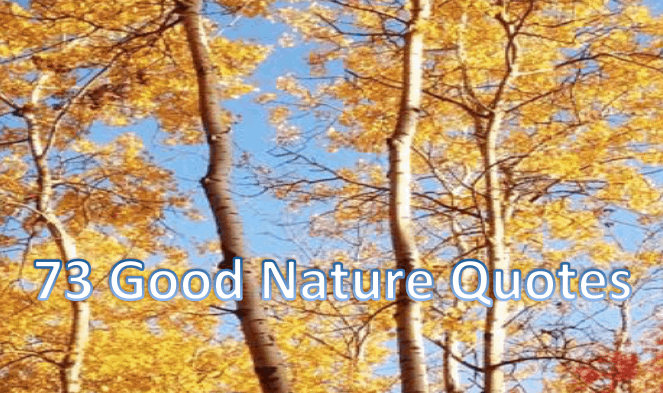 If you have any suggestions for additions to our nature quotes, please let us know via our contact page. Thanks.